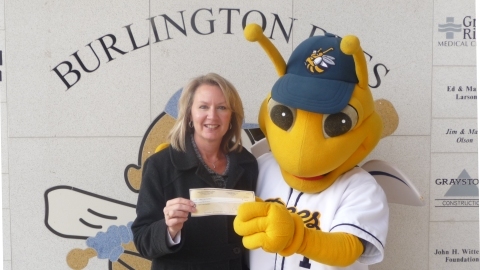 Burlington, IA (November 1, 2012) - The Burlington Bees recently made a donation of $750 to the Make-A-Wish Foundation as part of the Midwest League's On-Field Behavior Policy. Each season, the Midwest League collects fines from players and coaches who violate the On-Field Behavior Policy. Then the league distributes the fine money evenly to each member team, and asks them to give it to a deserving group or organization in their community. "The Midwest League does a great job in turning a negative thing into a positive one," said Bees General Manager Chuck Brockett. "The Make-A-Wish Foundation is such a wonderful organization that helps children through difficult times, and we felt they were very deserving of this donation." • Trips - Disney World, Hawaii, cruises, etc. • Gifts - computers, hot tubs, room makeovers, etc. Revenues to pay for the wishes come from fund raising events, corporate contributions, foundation grants, individual contributions, memorials, and bequests. The average cost to complete a wish in Iowa is approximately $9,000. The Iowa Chapter serves all 99 counties of the state, and consists of nine staff members and twelve volunteer area committees. There are currently nine dedicated Wish-Granting volunteers in the Southeast Iowa area. A Walk for Wishes fundraising event is scheduled for December 2nd at Westland Mall in West Burlington. For more information on the Make-A-Wish Foundation or to become a volunteer, please log onto www.iowa.wish.org or call 1-800-797-WISH.